Originally published in 1986, this was a new and completely updated edition of the book which, since 1970 had introduced a whole generation in English psychology to Kelly’s theory of personal constructs. By setting out a broadly designed and experimentally illustrated view of people as self-inventing explorers and interpreters of their world it challenged the ‘mechanical man’ of orthodox psychology. It proved a source of radically new ideas in psychotherapy, education and industry. This revised edition shows how the theory’s professional applications have spread ever wider, while many have realised that personal construct psychology contains, for them, the core of a personal philosophy. Preface. 1. The Psychology of Personal Constructs 2. The Person in Psychology 3. Exploring the Person 4. The Developing Person 5. Person to Person 6. The Person in Need of Help 7. The Person as Self-Creator and Self-Destroyer 8. A Personal Psychology. Appendix. References. Author Index. Subject Index. The study of personality has a long history and many different theoretical viewpoints within psychology. 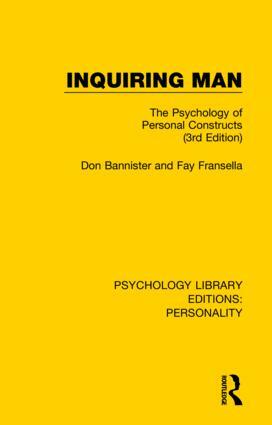 Psychology Library Editions: Personality (16 Volume set) presents titles, originally published between 1950 and 1997, covering many of these traditions and theories. It includes contributions from many well-respected academics and is a fascinating insight into this diverse field.